We're pleased to feature acclaimed instructor Joanne Hall on today's blog post. Joanne is a weaver, teacher, and author of Tying up the Countermarch Loom, Learning to Warp your Loom and Mexican Tapestry Weaving. She has a masters degree in Textile Design from the University of Minnesota. After teaching at the University of Montana and Cal Poly, she started the Elkhorn Weaving Studio where she weaves and teaches weaving as well as distribute looms and weaving supplies throughout the U.S and Canada. We took a few minutes to chat with Joanne about weaving and her upcoming class with us. Enjoy! When and how did you learn to weave? "I studied textiles at the University of Minnesota and I began teaching weaving at the University of Montana in 1971. Later I traveled to teach weaving workshops for guilds, for conferences, art centers and for weaving shops. Most of the workshops are tapestry weaving, but I also teach many different weaving techniques with a specialty in Swedish design." What are your favorite weaving projects? "Today I weave mostly for the workshops I teach. In the early 90s I purchased a drawloom and began weaving images which reflect my Swedish heritage. After a couple years I purchased another drawloom and I teach classes in damask and other drawloom weaves." "If you call fishing a craft, I do that on my time off." Beginning weavers may feel intimidated by tapestry weaving techniques. Tell us about the workshop you have planned at The Woolery for this November - what can they look forward to learning from you? "Beginners are always welcome in my classes. I like beginners and I can always find the time to help someone who need some extra time. I like small classes with time to weave and that gives me time to work individually with each weaver." "For tapestry, I start beginners on a frame loom, as the techniques are easier to learn on a small scale. In some longer workshops we then weave on looms with treadles, which let your hands be free to weave. Most of the tapestries I wove for galleries and for commissions were large and so they were woven on a large four shaft floor loom with a hanging beater and treadles. Here is a tapestry sampler I wove while weaving along with students in a two day beginning tapestry class. We start at the bottom where you can see some very basic stripes, diagonals and vertical shapes. On the top, each weaver works from a simple cartoon. 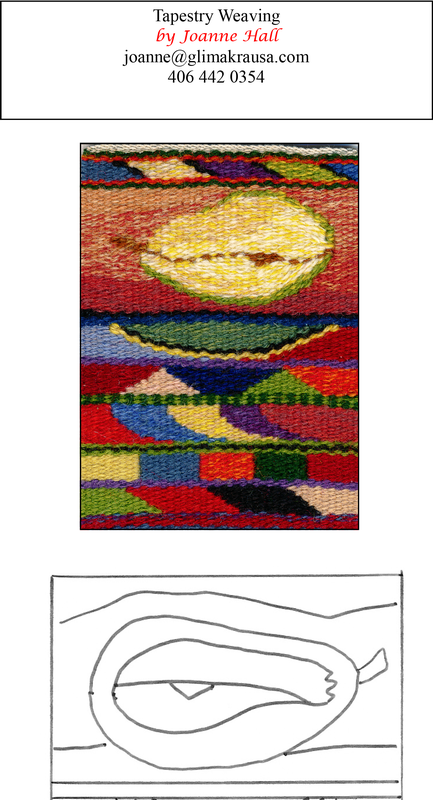 In this case, I wove a pear, which was from a cartoon in an older Swedish tapestry weaving book. Here are a few more of my tapestries. 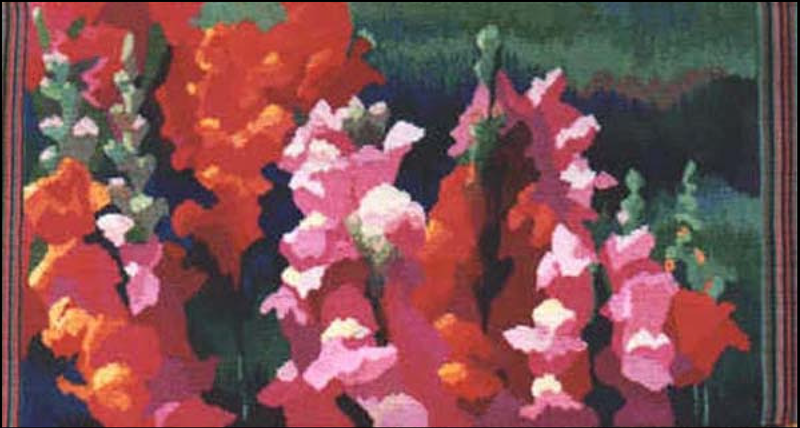 The Snapdragons tapestry is a small tapestry woven in plain weave. It is from the flowers in my mother-in-law's garden." 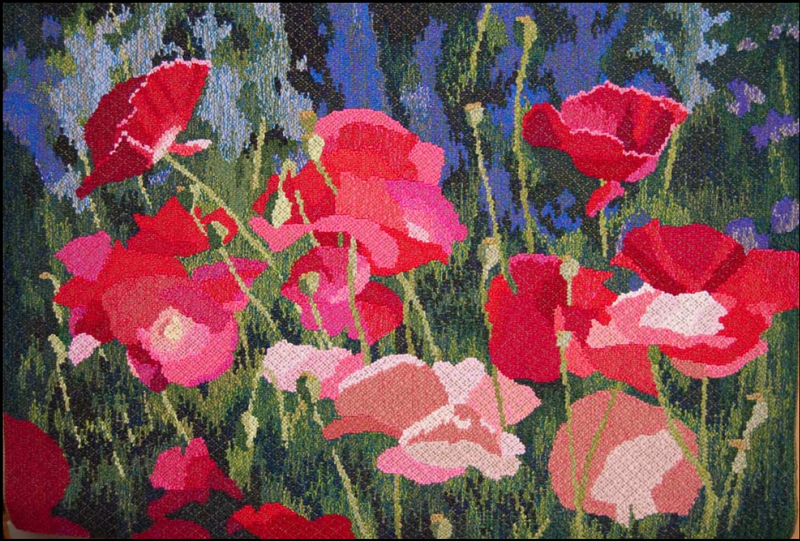 "Poppies is a larger tapestry woven from the flowers in my garden. It is woven on a four shaft floor loom with a rosepath threading. It is a technique I developed for weaving large tapestries." We look forward to exploring tapestry weaving with Joanne this fall - we hope you'll join us!